Drawing Tablet such as those made by Wacom are supported in TwistedBrush Pro Studio and can add great creative control to your work. 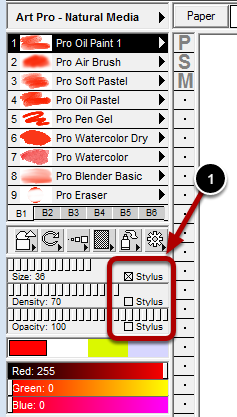 When you have a drawing tablet installed on your computer you will see these stylus check boxes for the Size, Density and Opacity sliders. When checked, the pen pressure applied will control the amount of the attribute that is in effect at that moment in your stroke from the range of none to the currently set maximum for that slider. Also see the Preferences topic for settings that are available for tablets.